Our Christmas Special December issue is on sale soon, this Friday, 2nd November in fact. It's packed with lots of lovely seasonal projects, including a free favour box template, ideal for your festive table. Plus there's a PanPastel masterclass and a fab 2013 journal. A list of contents is here. The free stamp is an absolutely gorgeous, and very versatile image from the lovely Glenda at Chocolate Baroque. Plus you can win scrummy new JOFY stamps from PaperArtsy. Hope you enjoy this issue and Merry Christmas! Then check out the BRAND NEW East Midlands Big Stamp and Scrapbooking show taking place this weekend: 13th & 14th October 2012,10 til 5 Sat, 10 til 4 Sun. The show is organised by the folks behind Ally Pally and includes some fab workshops as well as plenty of shopping opportunities! Adult tickets are £5. Congratulations to the following people who have won tickets for The Creative Stitches & Hobbycraft Show at Glow, Bluewater. Please email cs@traplet.com with your full name and address and we will get those tickets in the post to you. We hope you all have a fabulous day out. Thank you to everyone that entered and don't forget to keep an eye out for the next giveaway! It's that time again and another issue - September - has hit the shelves. So once again we'd love you to share your free stamp makes with us! This month's freebie is a stunning stamp designed by one of our own Design Team, Chrissie Stokes. This is such a useful and versatile little stamp, we can't wait to see what you've been creating with it. Show us your makes by leaving a comment and a link below. You don't have to have a blog to join in, you can link to any online space (e.g. a forum gallery) just be sure you leave your name if you don't have a blog. We have 10 tickets to give away to the fabulous Prima Homemade Show at Glow, Bluewater, which runs from 6th-9th September 2012. Prima Homemade incorporates Creative Stitches and Hobbycrafts, with over 200 exhibitors selling all manner of crafting goodies, plus demos and exhibitions. All in all a fab day out! For you chance to win a pair of tickets to the show please leave a comment by August 13th 2012. We will draw the lucky winners after this date. This month’s stamp is a fabulous vintage butterfly designed for us by IndigoBlu – so versatile you can use it for almost everything; we are sure this lovely stamp will become a firm favourite. Link up below to show us what you made with your butterfly stamp and you could win a fabby IndigoBlu stamp set! We can’t wait to see your creations! 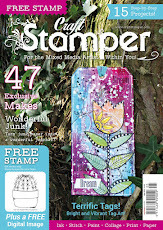 The August issue of Craft Stamper magazine is now out! Another fabby issue. There are some really original techniques and creations this month. Paula Whittaker shares a wonderful technique, which the team here have never seen before, where she uses highlighter pens to create some gorgeous backgrounds. Trish Latimer has made the cutest art dolls, Liesbeth demonstrates a very classy vintage image transfer technique and Kim Costello creates a rather spectacular 3D top hat (you can get the template here). The free stamp this month really is a must-have - a really lovely butterfly from IndigoBlu. Watch out for a new Linky soon so you can share your free stamp makes with us. There are some awesome giveaways too! A whole heap of PaperArtsy stamps and the distinctive new Steampunk stamp sets by Chocolate Baroque are up for grabs, amongst other yummy goodies. Enter the giveaways online here. We hope you find plenty of inspiration inside! Let me introduce myself. I am Laura Liddell, the new Editorial Assistant for Craft Stamper. I have much to learn and get my head around, but so far so good. What could be better than some bunting for the free stamp this month designed by Stamposaurus. Just stamp these onto patterned paper and make your own glorious bunting for the Queen's Jubilee, as well as many of your summer creations. As ever the issue is packed with wonderful makes, useful tips and mouthwatering colours. Kate Crane's Deli-cious book; Gail Milburn's small canvas with her own unique twist; the multi medium tutorial by Hels Sheridan; a fab fresh colourway by Trish Latimer with her Fran.tage tutorial and Paula Whittaker's fresh twist on New Home cards. These are just a few of the items that are featured this month. It is so lush and I am sitting her drooling over everything. Ding, Ding - time for Round Two! Full details of how to enter are in the latest issue of the magazine (and more details of the new format are in the post below). This round of the competition closes on 30th June 2012. Can't wait to see your designs! (Don't forget there is still time to enter Round One, sponsored by PaperArtsy - closes 31 May). 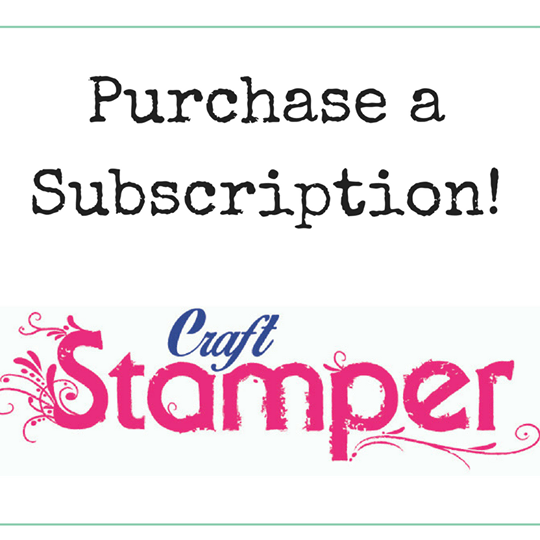 Applications are invited for the post of Editorial Assistant, Craft Stamper magazine. We are looking for someone with excellent time management and organisational skills, combined with a passion for rubber stamping. Applicants must also have an excellent command of written English, great attention to detail and the ability to cope with a pressured, deadline-driven work environment. Only applications from persons with a genuine interest in stamping can be considered, as product knowledge is essential to the job role. The job is in-house, based in our offices in Malvern, Worcestershire. We regret we cannot consider home working for this position. On the cover of our February issue we featured a stamp designed by the wonderful Sarah Lawrence, who since designing the stamp has very sadly passed away. In a fitting tribute, the challenge on The Cupboard Trilogy blog this month is to use Sarah's pretty heart stamp to create a project. The heart is really versatile so no excuse for not having a go! If you don't like hearts have a go at creating the flower Sarah demonstrated in her makes for the free stamp article. Pop on over to The Cupboard Trilogy blog to share the love! The challenge closes 10th March so plenty of time still to make something. Craft Stamper will top up the prize fund by adding a £20 goody bag, so get creating today!